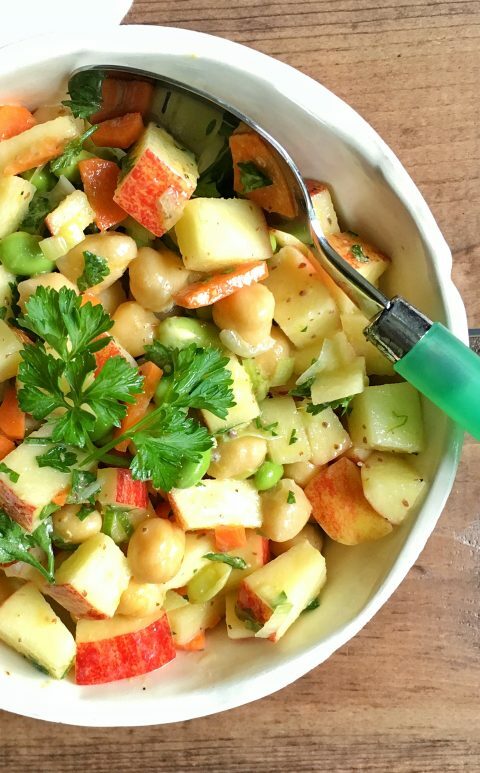 This sweet and savory side salad comes together quickly even on busy school nights by combining canned chickpeas with diced red apple, shelled edamame, thinly sliced carrots, fresh parsley, and a dressing made with lemon juice and olive oil. 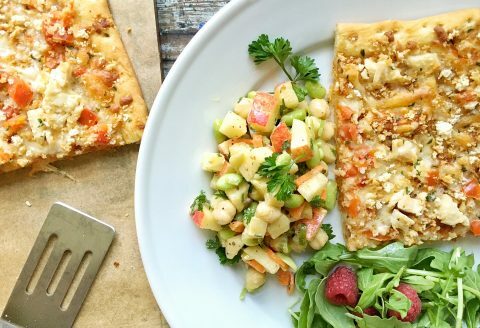 It’s the perfect fruit and veggie pairing for your family’s favorite frozen pizza. I created this recipe and post in partnership with Nestlé’s Balance Your Plate program. I was compensated for my work, and all opinions are solely my own. I love the one-two nutrition and flavor punch from pairing fruits with vegetables, which is why I decided to combine apples with chickpeas, edamame, and carrots. Did you know that chickpeas are a type of bean, and technically, they’re considered a vegetable? In fact, September is Fruits and Veggies – More Matters Month, an annual initiative led by the Produce for Better Health Foundation (PBH). It’s designed to help everyone from busy families to empty nesters find easy ways to include more fruits and vegetables in their daily diets and meet the Dietary Guidelines for Americans (DGAs). I hope this salad makes that goal more achievable. Frozen pizza or entrée + fruit and vegetable + low-fat milk or water = a balanced plate. 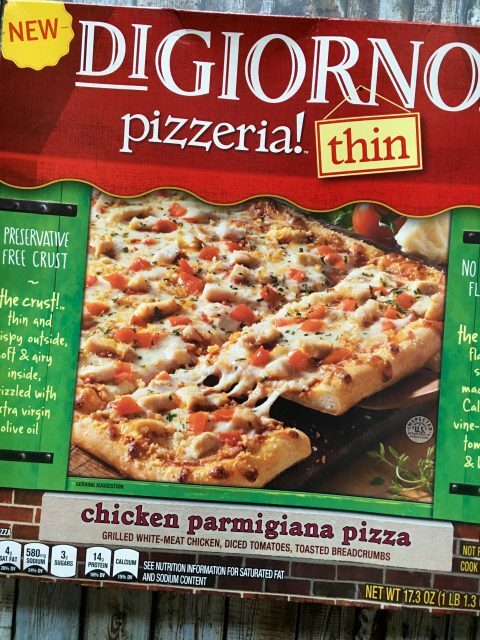 Here, I used DiGiorno pizzeria!™ THIN Chicken Parmigiana Pizza. I sliced it into four portions and served it with my apple salad. For even more fruits and veggies, I added a second side dish of arugula topped with fresh raspberries. The beans in my salad add an extra protein and fiber boost to the meal, and the crunchy apples provide a seasonal spin. On pizza night, balance your meal by filling half your plate with fruits and vegetables. 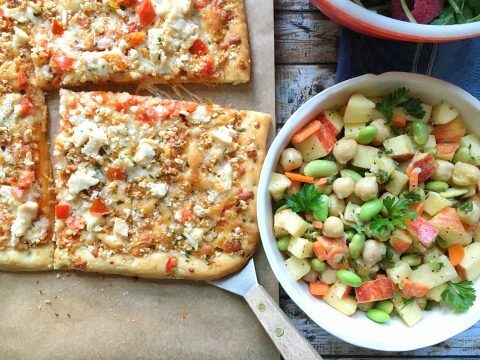 For meal plans and resources, check out Nestlé’s Balance Your Plate website or visit their Pinterest board for meal inspiration. Most people don't consume the recommended amount of fruits and vegetables. One reason is that fruit and vegetable side dishes are often forgotten. Well, it's time to bring back the side dish, and my salad is one easy way to do just that! My salad gets its sweetness from the apple, crunch from the carrot, and creaminess from the chickpeas and edamame. With a hint of lemon, this simple side dish is filled with fun flavor and pairs perfectly with pizza. 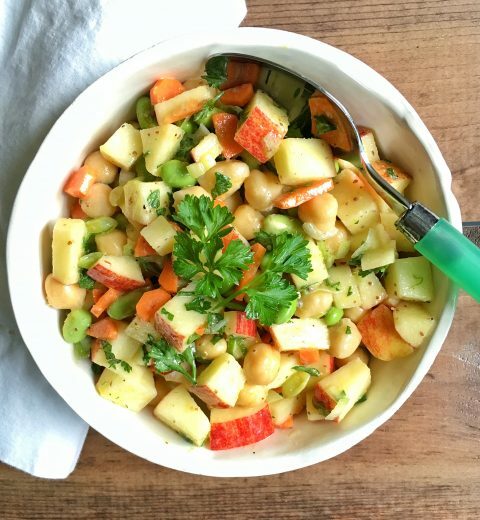 Place the apple, carrot, onion, chickpeas, edamame, and parsley in a large bowl and stir to combine. Set aside. Place the zest, olive oil, lemon juice,and mustard in a small bowl and whisk until well combined. Stir the dressing into the apple mixture until well combined. Season with salt and pepper to taste. This recipe makes 3 cups, and each serving has 50% vitamin A and 25% vitamin C.
I made this this week . It was a light tasty lunch salad to bring to work . This salad was refreshingly different and delicious. AND my 14-year picky eater liked it. Thank You! Wow. that’s the biggest compliment ever!! Glad everyone loved it. I made this for lunch today. Yum. Great combination of flavors. I chilled for about 20 minutes. DH and 2/3 teens loved it. 15 yr old vetoed because of edamame…he’ll come around.